I’m having so much fun with this game of Art and Lost Girl Mash-Up. I am asking who is Bo? Because we still don’t know that answer do we? We are all still learning her. Girl with a Pearl Earring. Girl with a Bamboo Earring. And, Girl with a Crossbow. Although, you can’t see the crossbow. If you are a fan of the Show, you know it is strapped to Bo’s back. I tried to get that in my screen cap, but the filming was too fast and dark. I wanted this angle exactly, and ended up with the crossbow blending into the shadows and Bo’s leather jacket. Bo is wearing a loopy earring (which is underwhelming compared to the other two earrings) but that doesn’t matter to me, because it’s the pose that is significant to my eye; not the earrings. “Girl with a Pearl Earring” is a well known painting by the 17th century Artist Johannes (Jan) Vermeer; painted sometime between 1664 and 1667 (speculatively, unknown for sure). Sure, a book was written and a movie made, but that was fiction. Nothing is known about this Girl Jan Vermeer painted. This type of painting was known as a tronie, which basically means the figure painted was not meant to be identifiable; in other words it’s not a traditional portrait. Tronies are typically a head or bust with the focus on the facial expression. The subjects are often dressed in costumes, which is believed to be true of “Girl with a Pearl Earring” (but no one knows for sure). “Girl with a Bamboo Earring ” is a contemporary piece by up and coming photographer Awol Erizku. And so the girl who posed for Erizku is somewhat of a mystery too. I’m sure I could find out all about her if I dug deeper, but I won’t. Because it’s the intention behind the piece (all three of these images) that caught my attention. Or rather, what my imagination imagines the intention to be. LOL. Each of these Girls, or Women, are looking over their shoulder with a fixed expression on their face. You can read all kinds of interpretations about Girl with a Pearl Earring (here) but no one really knows what she was thinking, or feeling, or wanting, or needing. 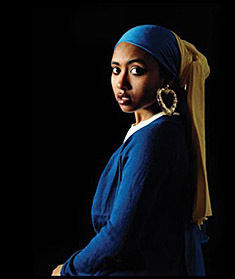 The Girl with a Bamboo Earring is more enigmatic to me. I wonder what her story is? Not the model, I could find that out if I looked for it. I wonder what her story is? Her costume is different than that of the Girl with a Pearl Earring. It’s very similar, but also very different. This tronie tells a different story than the original. And then we have Bo. The Girl with a Crossbow. The way her hair is swept tightly back in that severe pony tail is very similar to the turban and scarf dangling from the heads of the other two. The angle of her gaze, the line of her jaw, her shoulder. We know what Bo was thinking though, don’t we? She was angry and determined. On a mission to get Vex for killing LouAnne’s family, and mad and hurt by Lauren’s so called betrayal. At this point in the story Bo doesn’t know who she is though. Who is her mom? She doesn’t know that Trick is her Grandfather, and that he and Dyson have been keeping the secret of who her mother is from her. Who is Bo’s Dad? A flying horse with Bat Wings is all we’ve gotten so far. Each of these images are powerful portrayals of Women, but not proper portraits. They are all in costume pretending to be someone they are not. 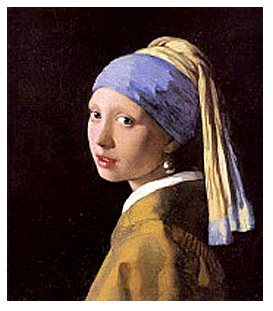 The Girl with a Pearl Earring was modeling in a costume for a painter who was (at that time) modestly successful. The Girl with a Bamboo Earring was modeling in a costume for a Photographer, and pretending to be the Girl with a Pearl Earring, but not really. 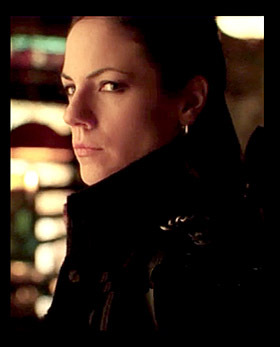 Bo doesn’t have a clue who she is yet (during Vexed) or even what she is fully? Her powers are still being revealed to her, and her destiny. So, she armors herself with weapons, bravado, and a heavy dose of frustration and anger. Bo wasn’t pretending so much as clinging. Tightly clinging to her humanity in a world that doesn’t value human beings; wanting vindication for a human family that was slaughtered to set an example. That over the shoulder pose is what caught my eye. The varying expressions each of the women is wearing. Who are You? Is the question I want to ask each of these women. They are all compelling and intriguing to me. I was excited when I read “Girl with Pearl Earring” because I thought, finally, an art piece that I am familiar with and now I learned a little more about it. 🙂 I really like how each woman’s face is half in light, half in dark… which I suppose Bo falls into in an almost literal way. Philosopher Emmanuel Levinas talks of ethics in such a way that relates to how we meet another person’s gaze. We can either ignore or respond to the face of the other because only the face “stays most naked.” Another person’s face allows us to, well, face the fact that we are accountable not only for ourselves. I imagine him seeing faces such as these, faces that one can’t help but respond to, if only to look back for a few more seconds. Have I told you I enjoy these art posts more than fanfics? Seriously. More, please. Nice, Baby Doc! It is true too, isn’t it, that Bo’s face is closed where the others’ are open. Thank you Baby Doc. 🙂 I love your observation about Bo’s duality in light and dark and it fits nicely with the theme of this past Season 4. I also enjoy your thoughts on meeting another person’s gaze. Each of the three images made me think about that. The pose is set up in such a way that it feels (to me anyway) that each of them is making eye contact with whomever happens to be looking at the painting/photo. It’s really unnerving in a way which makes these pieces interactive and personal to some extent.